1 staffel was formed from elements of 6./JG 300 and in January 1945 redesignated 7./NJG 11. 2 staffel and 3 staffel formed from 1./NJGr 10 and in January 1945 redesignated 1./NJG 11 and 8./NJG 11 respectively. II./NJG 11 was formed in November 1944 from 10./JG 300. III./NJG 11 was formed in January 1945 and in March 1945 redesignated 2. NJG 11. 10. Staffel was formed on 28 January 1945 at Burg-Magdeburg from Sonderkommando Welter flying Messerschmitt Me 262 jet fighters. NJG 11 was reorganized on 30 March 1945. The Stab was disbanded and the Gruppen reduced to Staffeln which were assigned to Nachtjagdgeschwader 3 (NJG 3) and Nachtjagdgeschwader 5 (NJG 5). The Focke-Wulf Fw 190 A-8 and A-9 equipped with the FuG 217 or FuG 218 Neptun V radars were utilised by the unit, though several Bf 109 G-6, G-10 and G-14 models were also used. In December 1944 the piston-engined elements of NJG 11 gave up sustained anti-Mosquito operations and confined itself to illuminated target defence night fighting against the heavy bombers of the RAF. 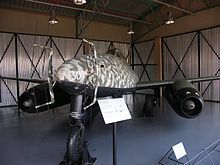 Radar equipped Me 262B-1a/U1 in the South African national museum of military history. 10./NJG 11 under Hauptmann Kurt Welter, an experienced 'Wilde Sau' ace, commenced operations using a handful of single-seat Me 262 jets in December 1944. Seven two-seat conversion night fighter variants, designated Me 262B-1a/U1, were available by April 1945. To make room for the radar operator fuselage fuel capacity was sacrificed, and a pair of undernose hardpoints, one either side of the nosewheel well, for fitment of a pair of standard Luftwaffe 300 litre (79 US gallon) drop tanks were fitted. Following trials with radar fitted to a single-seater the two-seaters were equipped with the mid-VHF band FuG 218 Neptun V radar, with prominent Hirschgeweih (stag's antlers) eight-dipole aerials on the nose reducing the top speed by about 30 mph. Hinchliffe, Peter (1998). Luftkrieg bei Nacht 1939–1945 [Air War at Night 1939–1945] (in German). Stuttgart, Germany: Motorbuch Verlag. ISBN 978-3-613-01861-7. This page was last edited on 13 November 2017, at 13:37 (UTC).